The Executive Director of the Muslim Family Council Services (MFCS), Chief Alhaji Imoro Baaba, has urged the government to show more interest in the work of the National Population Council (NPC) as it is a vital arm of government that acts as a springboard for government developmental agenda. 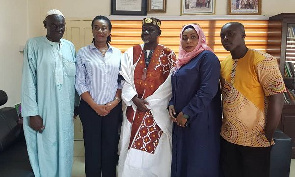 Chief Alhaji Imoro Baaba made the remarks when he paid a courtesy call on the Executive Director of the NPC, Dr Leticia Adelaide Appiah last Wednesday, February 6, 2019, in Accra. Chief Alhaji Imoro Baaba said a lot of people do not understand the work of the council hence the very little prominence it receives, urging the government to provide increased support to the NPC if it desires to see meaningful development. “The establishment of the National population Council dates as far back to the Busia regime which saw population, family planning as the way to go if visible developments are something to go by,” he opined. He was of the view that there is the need for partnership to better position family planning strategically for national development, educate its people and provide the requisite information for their follower and provide better understanding regarding the integral nature of NPC’s work in national Development. “Family planning is the way to go,” she said, adding that it is like missionary work, hence all must join hands in achieving a mandate of providing an improved and sustained quality of life for all Ghanaians.